NEW YORK – Batman appears to have finally met his match – at least for now – at the hands of his longtime nemesis, the Joker. The caped crusader is unconscious, knocked out by one of the Joker’s nefarious traps, in the new issue of his namesake comic, which hit stands this Wednesday. At the end of the issue, the Joker stands triumphant over his fallen foe, leaving Batman with no chance of surviving whatever evil fate is in store for him. It appears to be the end of a long run for Batman, created in 1939. Best known for the 1960s television adaptation, the character has also sold millions of comics and countless pieces of merchandise, making a great deal of money for the character’s publisher, DC Comics, and the parent company, Warner Brothers. However, in the world of comics, a last-second triumph against overwhelming odds is not entirely unknown, and DC Comics president and publisher Paul Levitz said Batman grabbing victory from the clutches of defeat wasn’t out of the question. 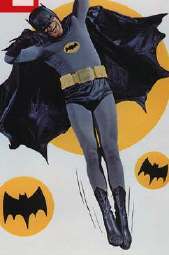 Even so, the character’s shocking loss came as a blow to creator Bob Kane, or it can be assumed it would have, if Kane himself hadn’t died in 1998. “Remember the ‘Death of Superman’ all those years ago? And all the hype around it? To this day, I encounter people who see the Superman comics on the rack and ask me, ‘Superman comics are still around? I thought he was dead.’ I just don’t see the advantage to convincing a public that’s barely aware of comics in the first place that your most recognizable, marketable characters are no longer being published, all for the sake of a storyline that’ll be resolved in, at most, a few months! What’s wrong with you people? Why are you buying into this?” At this point, Sterling was guided into the back room of the store for some quiet time. In the comic book universe, defeat is not always final. But even if the Joker has finally defeated Batman once and for all, it’s not the end of the Dark Knight: the character will still live on in merchandise and movies and television shows, where the real money is. Some portions of the text liberally borrowed from here.